When comparing prices on pressure washer rentals in San Jose, Hollister and Santa Cruz, ask about sales tax and environmental fees. 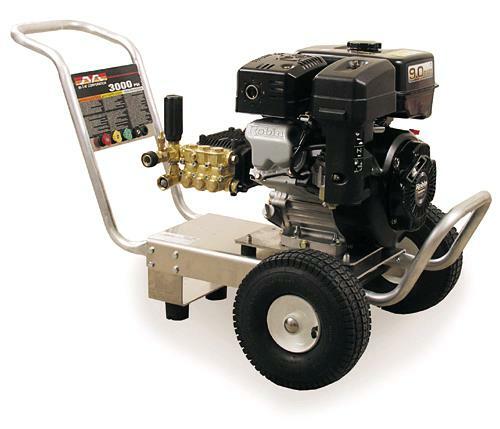 This rugged aluminum pressure washer is perfect for pressure washing driveways, houses, farm and automotive equipment. This lightweight unit is highly portable and easy to move no matter what the application. 3/8 inch x 50 foot non-marking hose with quick connects. Rental includes 0, 15, 25, 40 degree and detergent nozzles and first tank of fuel. * Please call us for any questions on our 3 000 psi gas pressure washer rentals in San Jose, Campbell, Salinas, Santa Cruz, Watsonville, Morgan Hill, Hollister, Santa Clara, Gilroy, Milpitas Sunnyvale, Fremont, Salinas, the Greater Bay Area and the Monterey Peninsula.